The US targeted a Taliban compound in a cross-border strike into Pakistan’s tribal areas today. The strike took place in the Kurram tribal agency and was the second attack there since December 2008. The Predator airstrike hit a Taliban compound and training camp in the Barjo region in Kurram. “The training camp was completely destroyed,” a villager told Reuters. At least four Hellfire missiles were reported to have been fired at the camp. Unconfirmed reports indicate up to 14 people, including “foreigners,” were reported killed in the attack. The term “foreigners” is often used to describe al Qaeda operatives sheltering in Pakistan’s tribal areas. No senior al Qaeda or Taliban leaders have been reported at this time. Today’s attack is the first since March 1, when Predators targeted a Taliban compound in a region of South Waziristan controlled by Pakistani Taliban leader Baitullah Mehsud. The first US attack in Kurram took place on Feb. 16 of this year. More than 30 people, including Arab al Qaeda fighters, were reported killed in the attack. Previous airstrikes have focused on Taliban and al Qaeda training camps and safe houses in the tribal agencies of Bajaur and North and South Waziristan. One other strike hit a Taliban camp in the settled district of Bannu in the Northwest Frontier Province. The Taliban have expanded their control into Kurram by backing the wave of sectarian fighting between Sunni and Shia in the region. The Shia have been forced into small enclaves in Parachinar and other areas as the Pakistani military has refused to come to their aid. 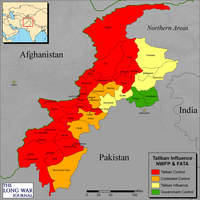 The Taliban have used Kurram as a training ground for their forces and have established several bases in the agency, an intelligence official familiar with the situation in Pakistan’s tribal areas told The Long War Journal on the condition of anonymity. Taliban commander Hakeemullah Mehsud is behind the attacks on NATO convoys in Khyber and Peshawar. Photo provided to The Long War Journal by Bill Longley. The Taliban in Kurram are led by Hakeemullah Mehsud, a rising star in the Pakistani Taliban. Hakeemullah is a senior lieutenant and cousin of Pakistani Taliban leader Baitullah Mehsud; he is also a cousin of Qari Hussain Mehsud, the notorious Taliban commander who trains child suicide bombers in South Waziristan. Hakeemullah has been leading operations against NATO’s supply lines in Khyber and Peshawar. He also commands the Taliban in the Arakzai and Khyber tribal agencies. The unconfirmed death toll grows. “The strike was in the Kurram belt. It destroyed a suspected den used by Taliban militants, killing at least 20 militants, including foreigners,” said a senior security official, adopting a term used to mean al Qaeda members. A second senior security official confirmed the strike and the same details, also speaking on condition of anonymity. The number injured by the strike appears to be significant as well. 15 killed + 50 wounded = not enough missiles on target. My2cents: Correct but still 20+50 = 70 out of action. What d’ya say? The latest update this morning increase the death count even more. Two missiles fired by an unmanned drone destroyed a Taliban training camp. “We have handed over 24 bodies after cleaning and wrapping them in cloth,” officials said. How long was the US to wait to strike these camps? 157 or so camps built and manned during Bush-Musharraff, why did they not act? The airstrikes should be ramped up and include manned aircraft. There is a lotta red on that map and it looks grim. The PAK military is either incapable-or unwilling to fight the militants. Thier army must be rife with t-ban/AQ collaborators, and it looks like Kayani is the real power here. No stable A-stan with the enemy operating with impunity across the border. The Thunder Run has linked to this post in the blog post From the Front: 03/13/2009 News and Personal dispatches from the front and the home front. And where are these 50 wounded being treated? Someone should go and capture those guys and their facilities. Are they soldiers or criminals? As for why not strikes… politics aside, only hits on target count, right? I’m not questioning the intel here, but I would think that there would at least be double-checking before a strike would be approved, by which time the opportunity might or might not still be there to do enough damage to justify the strike. TJ: Up to 24 dead + 50 wounded now, but there are still to many survivors. Reports are that they only used 2 missiles, so probably only one Predator. They should have sent at least a 2nd Predator with 2 more missiles ot observe the clean up / rescue operations and target surviving leaders. There has to be some kind of intel that calls for an airstrike. How many Global Hawks, other drones, sat intel and eyes on targets is the question. There must be some kind of surveillance going on. I think a Hellfire is a helluva weapon, but it does not have the destructive power of a 1000lb PGM. Wat happened to the SDB? You guys are assuming we had the time to get the aircraft over the target, could have simply been a target of opportunity that was not going to last long. Since we’re not hitting all these camps we seem to know about, it’s quite possible that intel came in that certain individuals may have been there and what ever was in the area was used to engage before the opportunity was lost.